A Ford 150 rear ends city bus #612. Photo by Aric Aczel. The first collision occurred around 1pm when a female pedestrian was struck outside the Shoppers Drug Mart on Huron Church near Tecumseh. She was transported to hospital with non-life threatening injuries. The second collision occurred around 2:30pm at the intersection of Lauzon Parkway and Tecumseh Road East. Only one person involved complained of back pain and everyone else involved remained unharmed. Windsor Fire & Rescue attended the scene to clean up a large fluid spill from the vehicles. The third collision occurred around 4:20pm at the intersection of Tecumseh Road East and Parent, directly in front of the Caboto Club. Injuries were minor in nature. 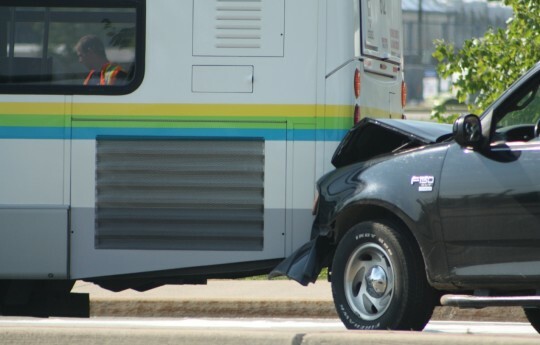 The fourth collision occurred around 4:30pm at the intersection of Catherine and Lauzon Parkway when a pickup truck rear ended a city bus. Nobody was harmed. The truck was not drivable and needed to be towed. The fifth collision occurred around 5:15pm at the parking garage of an apartment complex on Chatham Street East just west of Pierre. A female driver crashed into the wall of a parking garage and was initially trapped, however she did not need to be extricated. She was transported to hospital with non-life threatening injuries.